DMV.com was created to help simplify your life by providing you with all the vehicle related information and Nebraska DMV services you may need, in one place. Quickly find information and services regarding driving records, vehicle registration, drivers license renewal, license plate renewal, getting a learners permit, and finding a Nebraska Department of Motor Vehicles approved traffic school. An NE drivers license must be obtained at the DMV. Learn how to change drivers license address, order a duplicate drivers license and more. Ordering Nebraska driving records online is the fastest way to get your driving history. Request your DMV driving record right from home. The Nebraska DMV requires drivers to have minimum auto insurance coverage. Compare auto insurance rates and find cheap auto insurance. Drivers who complete NE traffic school can have tickets dismissed and receive insurance discounts. Discover online traffic school benefits. 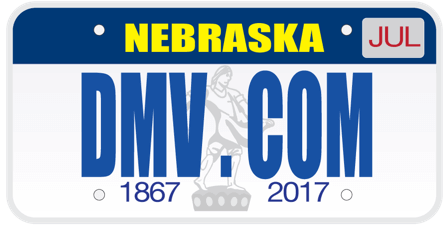 Take a Nebraska DMV sample test before you register for the license exam. A DMV practice exam will help you to pass the actual license test. Auto registration in Nebraska is managed by the DMV. Learn about new car registration, changing car registration address details and more. Completing NE drivers ed classes can help new motorists earn their driving credentials. Discover the benefits of online drivers education today. A Nebraska car bill of sale is an important document to have when you buy or sell a car. Learn how to get a bill of sale from the DMV today. Drivers with NE traffic tickets must respond. Learn how to fight speeding tickets and how to pay speeding tickets online in Nebraska. Drivers who receive a DUI conviction in Nebraska will have their license revoked by the DMV. Learn more about DUI consequences in NE. Whether you plan to buy a new car or used car in Nebraska, consult our resources first. Buy a car online to expedite your DMV registration. You can obtain Nebraska DMV services at a DMV office near you. Find a DMV location in your area today. DMV.com is the website that will help you find every information connected to the Nebraska Division of Motor Vehicles. Know that this is a privately owned website that is not affiliated to any government agency. So you won’t bother dealing with government bureaucracy in your search for a useful facts about Nebraska DMV. We offer you up-to-date information in easy-to-understand format. Our articles provide you with facts about obtaining and renewing a driver’s license, choosing the best insurance for your vehicle, license plates, credit scores, driving schools, drivers manuals – from A to Z. All you have to do is either use the “search” bar on the page or the navigation sections when looking for information. Although we already have an abundance of useful facts, you can also join us and make this website even better, by editing the pages, commenting the articles, sharing your experience on Facebook, etc.